I have one person I could totally dedicate this song too. For some reason though it seemed sometimes like you hated me not like you loved me and yet I stayed with you like a fool. I will never do that again. I made that promise to myself and I plan on keeping it. So as I look forward to many a journey not knowing where the road will lead… I find I am just looking forward to the journey! And if you are lonely and need a friend remember I have a seat right here next to me. What if we could just talk right now… I don’t want to wait. Let’s talk until the sun comes up. I want to get to know you better but I am scared too. About me…I am such a night owl. I have some of my best moments at 2 or 3 in the morning or so I thought. For a long time now I had checked out of my life. I was just working to pay the bills…and watching TV series on amazon prime when not doing school work or going to night class. I have friends and I am very in touch with people on a daily basis. I am not a loner by any means. I find that what catches me the most is fantasy or science fiction and I can immerse myself in a great story or world. Makes real life dull somewhat in comparison. Lots of things I have done in my past in my life have jaded, hardened, and made me a very cynical person. I have lots of brick walls and barriers up to protect myself. I thought of it as my favorite story from when I was little… a little golden book called The Monster at the end of this Book. 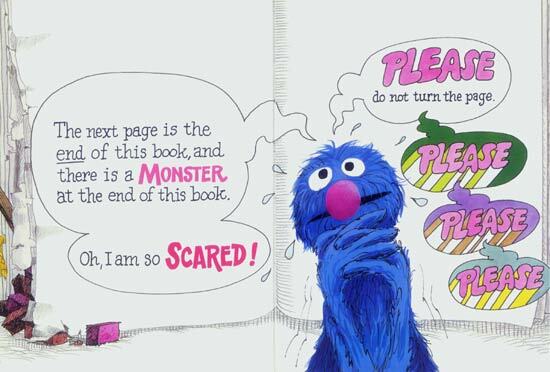 I will save you all the suspense as Grover himself is the monster that he was so scared of being at the end of the book…so scared he tries to stop you from getting to the end. I guess this sums up my position on most recent life developments. On another note I have been watching a fantastic series… Fringe. I am in the third season now. I don’t know why I never came across it before. I love the story line and my favorite character is Peter Bishop. I tend to be more like prime Olivia in my own life… very guarded and well like everything I have already stated above. Maybe it is time to take some chances again.